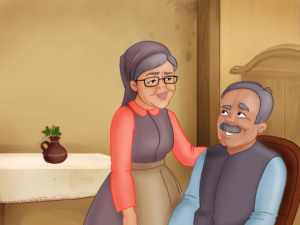 A long, long time ago an old woman and an old man lived a quiet life in a small cottage by the river. One day the woman decided to make a gingerbread man for them to eat. 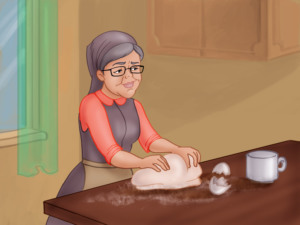 She mixed flour, butter and eggs in a bowl and then she rolled out the dough carefully. She then cut out a lovely gingerbread man and gave him blueberries for his eyes and buttons and icing for his mouth and clothes. 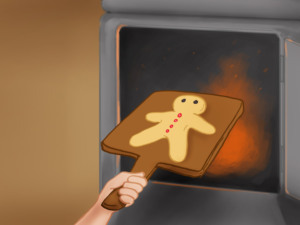 The woman put him in the oven to bake. 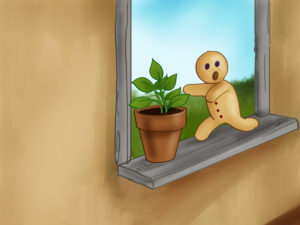 Soon enough, he was ready and the woman opened the oven door, but to her surprise the Gingerbread man jumped out of it. “Don’t eat me!" he shouted in terror and ran out of the window. The woman and the man started chasing after him. “Stop! Stop!” they shouted, but he was faster than they were. “Run, run, as fast as you can! 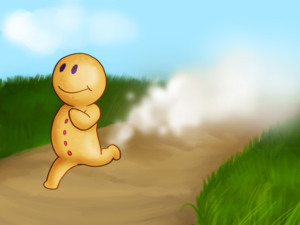 You can’t catch me, I’m the Gingerbread man," he laughed and kept running. As he was running, he came across a pig. 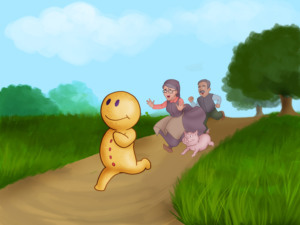 The pig tried to take a bite out of him but once again the Gingerbread man was faster. “Run, run, as fast as you can! 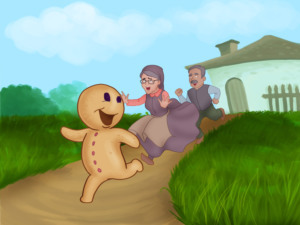 You can’t catch me, I’m the Gingerbread man," he said and carried on running. 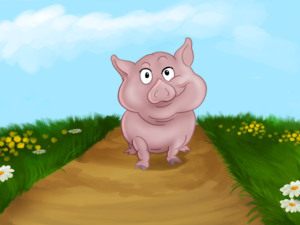 The pig joined the chase and now the old woman, the old man and the pig were running after him. But the Gingerbread man was faster. Further along the path he came across a cow. 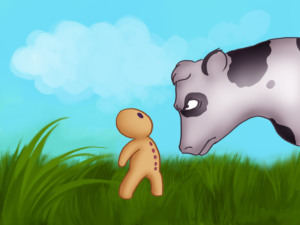 “Stop!” called the cow, “I want to eat you." 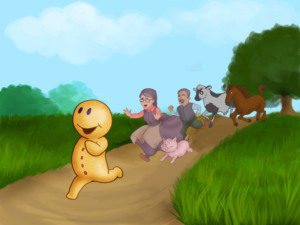 But the Gingerbread man started running again and the cow couldn’t catch him. “Run, run as fast as you can! 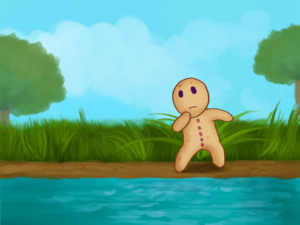 You can’t catch me, I’m the Gingerbread man!” he said. 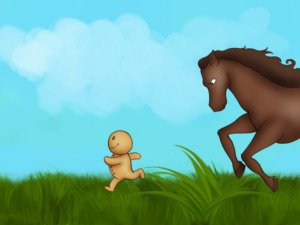 The horse joined the old woman, the old man and the pig, but the Gingerbread man only laughed at them. He kept laughing until he reached the river banks. “Oh, no! Now they will get me and eat me! If only I could cross the river," he thought. The Gingerbread man had no other choice. 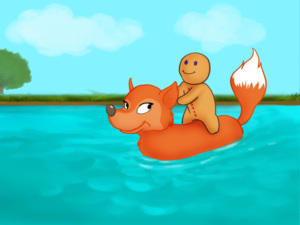 He jumped on the fox’s back and they crossed the river easily and safely. 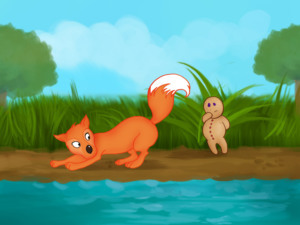 As soon as they stepped onto dry ground, the Gingerbread man thanked the fox. 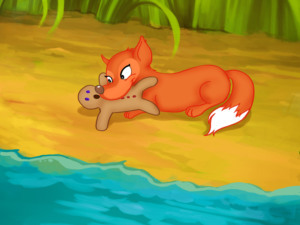 But a second later the fox opened his mouth and gobbled up the Gingerbread man.